Next to the deck, nothing has a greater impact on the quality of your ride than the trucks you choose. With trucks, quality materials and precise geometry work together. Start with a lack of one or the other, and the whole component is bound to suffer. The best longboarding trucks help us get the most out of our setups. Of course, no longboard trucks are suitable for every style of riding. Manufacturers engineer differences — some subtle and some glaring — into their trucks to help them better perform in certain conditions. Downhill riding brings with it a different set of requirements than does carving, after all. So, how does one identify a great truck for any one riding style? The key is to look for a combination of quality and discipline-specific geometry. 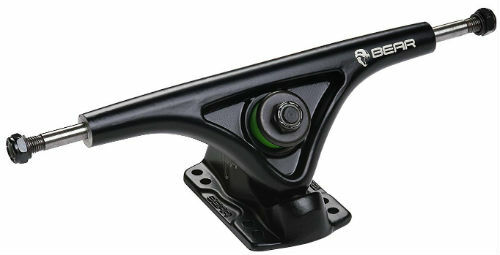 We’ve isolated some of the best trucks on the market. They are each great at what they do. In the end, that’s all we can ask. 2.1 Which type of trucks do you need? With this novel design, Gullwing set out to make the best longboard trucks for carving — and mostly, it succeeded. The Gullwing Sidewinder double-kingpin trucks use a unique, double-pivot design to maximize the carve. As the rider first leans, they seem normal because only one bushing set is engaged. When the second set kicks in, hard-diving turns result. The Sidewinders come with two 89A barrel-and-cone combination bushings per truck. The 10-inch axle widths are most common, but a 9-inch version (Link to Amazon) is available for mini cruisers. The pivot angle is steep, and the tendency to turn dramatic. Anyone considering downhill or freeride should avoid them because they lack stability, but they are not made to be stable. For surf-inspired kick turns and slashing carves, though, the Sidewinder is hard to beat. Sidewinders outturn most other trucks on the market easily. The ability to tighten one kingpin nut more or less than the other provides superior adjustability. They have the smooth ride that manufacturers with decades in the business understand how to provide. The extra pivot increases the wheelbase of the setup, though this is compensated for by the tight turns. Will not work with just any deck; require risers or cutouts. Beware wheel bite. Bear trucks, made by Landyachtz, carry the same reputation for quality as their parent company. The Bear Grizzly is a now-classic, reverse-kingpin design that Landyachtz has continually updated since its introduction. The design of the offset hangers allows them to be flipped over, reducing the 52-degree pivot angle to allow for a more stable ride. Grizzlies have eight bolt holes instead of the usual four, allowing for precise wheelbase adjustment. At the 52-degree position, they are 66 mm tall, but when flipped their height drops to 60 mm. They have a double-barrel bushing configuration, which provides stability when the Grizzlies are in the flipped position. They also have easy turn-in, making them some of the best longboard trucks for sliding as well. Flippable hangers eliminate the need to purchase different trucks for downhill and carving. Restrictive bushing seating and double-barrel bushing configuration make Grizzlies some of the best freeriding trucks. Multidiscipline approach makes Grizzlies some of the best trucks for longboarding beginners who have yet to settle on a discipline, as well as those who refuse to. The restrictive seats and barrel bushings add a snappy rebound that makes carving on Grizzlies a different experience even for experienced riders. Trying to be a great downhill truck and a great carving truck is a tough ask, and the results are better at higher speed riding than carving. Did Paris make the strongest longboard trucks around? Judging by the lifetime warranty on the Paris V2, the company certainly thinks it did. V2s are reverse-kingpin trucks with 180 mm hangers (there are other sizes as well) and 9.5-inch axles. The cone-and-barrel bushings have a 90A durometer, and at 65 mm tall, they accommodate most of the best longboard wheels. V2s have a 50-degree pivot angle, which combines with the bushing configuration to make a truck that carves willingly, if not aggressively. Paris utilized just enough options to provide stability, without unduly widening the turning radius, which is why freeriders have flocked to these trucks for years. This is the newest generation V2, however, incorporating a non-restrictive and polished bushing seat that supplies smoothness. Meanwhile, six bolt holes allow the use of old school and new school decks alike. V2s have an uncommon combination of snappy turns and rock solid stability. You don’t offer a lifetime warranty unless you know you’ve used the best materials. They may “do it all,” but should not be ridden at break-neck speeds. Caliber is a sister company of Blood Orange, maker of some of the finest longboard wheels. 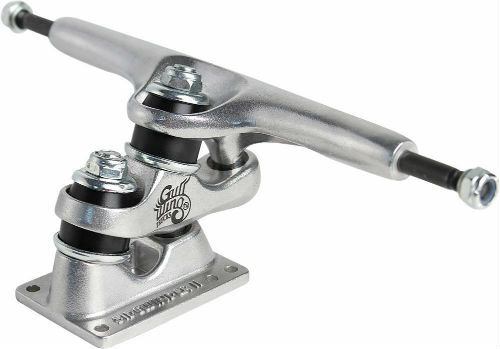 Its Caliber II trucks have reverse kingpins and are available with two different pivot angles. The 50-degree Caliber IIs are an excellent choice for freeride, but the 44-degree options may be the best longboard trucks for downhill on this list. The round kingpin hole in the hangers are a love-it-or-leave-it feature. They avoid any possibility of hang up at fuller lean angles, but they do it at a cost of maneuverability. Strange that such a small issue would loom so large, but it does: the circular holes increase the stability of the truck, but they are always prominent. The Blood Orange bushings are 98A, and they come in a cone-and-barrel configuration. Ultra-stable reverse kingpin design, but still peppy thanks to additions such as cone-and-barrel bushings. Bushing seat and housing show the forethought required to make a truly intuitive truck. Rather tall (69 mm), allowing for the use of a variety of wheels without riser pads. Circular — instead of oblong — kingpin hole is more of a novelty than a true innovation. Which type of trucks do you need? The sea of longboard truck options is vast and diverse. Choosing the right ones involves selecting a discipline and narrowing down options to tailor a setup to the riding style. Cruisers and carvers need trucks with snappy, responsive turning characteristics. The opposite is true for downhill, though, where stability is king. Meanwhile, freeride trucks may utilize certain features found on trucks meant for either of the other two major disciplines. 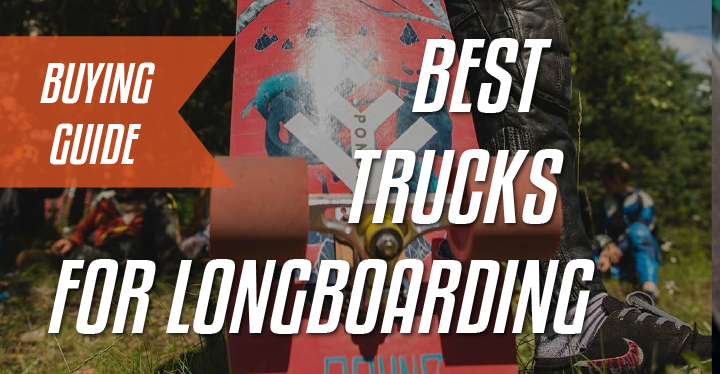 In this longboard truck guide, we will discuss the various features of trucks, as well as how manufacturers tweak those features to produce the desired results. Mainly, these choices are made to either enable or restrict maneuverability, though there is normally room to personalize a setup’s riding characteristics. 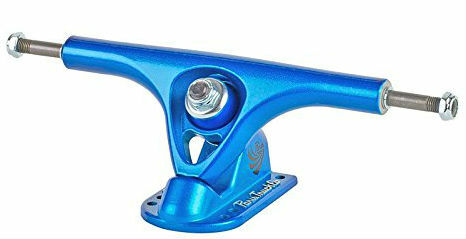 Precision trucks may be either CNC milled from billet aluminum or forged. These processes — especially milling — produce hangers and baseplates that have fewer of the imperfections that plague cast parts. They enable trucks to be made to exact, precise tolerances. The benefit of this precision is a truck that steers true and is considerably stronger than its cast competition. Typically, precision trucks have restricted, though perfectly fitting, bushing seats that limit the maneuverability of the truck. The lack of turning ability works well for downhill, though. Precision trucks typically have features that suit that discipline, where small inputs are amplified by the sheer speeds involved. 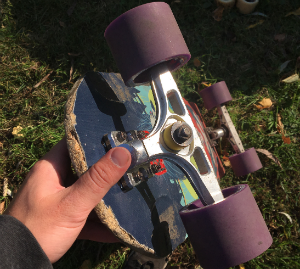 Precision trucks can cost several times what a cast truck costs, however, and the benefits are normally lost on the other disciplines of longboarding. The hanger is the larger of the two aluminum pieces of the truck. Cast hangers (and baseplates) are typically made in one of two ways: sand or permanent mold casting. The video below shows Tracker trucks being sand casted, while this one shows Independent trucks being made in a permanent mold. They each involve to pouring of molten aluminum in a mold. Hangers’ widths are normally given in millimeters. The pointed end in the middle of the hanger is called the pivot, and it connects to the baseplate. Hangers also have holes, through which the kingpin passes, and seats for the urethane bushings. Open seats allow for more maneuverability and work best for carving, whereas enclosed seats work best for downhill because they restrict the trucks’ ability to turn. Hanger design does not vary much between disciplines. Rather, it is the geometry of the baseplate with the hanger attached that determines the discipline for which a set of trucks will work best. Some hangers are made so that flipping them will radically alter the steering characteristics, giving them the ability to work for multiple disciplines. The baseplate is the part of the truck that bolts onto the deck. 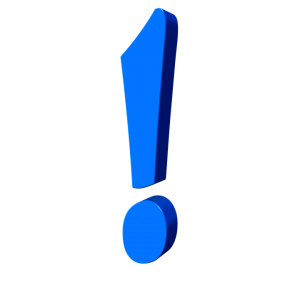 It has an indentation, called the pivot cup, in which the hanger’s pivot rests. This apparatus works as a ball joint, allowing the hanger to move freely from side to side. It is this movement that allows the rider to steer the board. Baseplates have at least one hollowed out cavity into which the kingpin bolt is inserted. Some manufacturers design their baseplates so that the kingpin threads into it from above. These designs normally have a hex head kingpin, requiring the use of an Allen key. The far-more-common method is to have the threads of the kingpin stick out near the hanger, and to then use a Nyloc nut to tighten down the hanger. Choose The Right Baseplate Pivot Angle! The angle of the baseplate is based on a line drawn from the pivot to the point between the bushings. Steeper angles of around 50 degrees make for responsive trucks that dive into turns. They are great for carving, but they are too responsive for the blazing speeds of downhill longboarding. The varying disciplines of longboarding demand varying steering geometry. Simply put, the higher the degree of pivot angle, the more responsive the truck will be — the tighter it will turn. In high-speed downhill riding, higher responsiveness leads to dangerously tight turns and the dreaded speed wobble. A happy middle ground for freeride might be a 48-degree baseplate, but riders who fly down hills should opt for baseplate angles closer to 40 degrees for the sake of stability. Note that a flatter angle will bring the axles closer to the deck, increasing the chance of wheel bite. This is one reason that many longboards have wheel cutouts. Pay Attention to Kingpin Position! The conventional way to mount trucks is with the kingpins facing inward. This orientation maximizes the turning radius of the truck and makes sharp turns easier. Reverse-kingpin trucks mount with the kingpins facing outward. Like a higher pivot angle, the reverse-facing kingpins stabilize the truck, especially at higher speeds. Downhill and freeride longboarders tend to use these trucks, while cruisers tend to use trucks with conventional kingpins. Pick The Right Width Axle! The steel axle, which runs through the aluminum hanger, is the part onto which the wheels mount. It is considered a part of the hanger, but for our purposes we will look at as a lone piece. During manufacture, the axle is placed into a mold, and molten aluminum is poured in and hardens around it. When trucks bend, this is the part that is bent. Therefore, the more stout the axle is, the longer the trucks should last. Most longboard truck axles are 8 mm in thickness. This uniformity allows the precision bearings to have a corresponding inner-race size. The width of the axle is normally given in inches. As this is the true width of the trucks, this measurement determines if a set of trucks will work with a deck. The bushings are the urethane grommets that are positioned on the kingpin, one on either side of the hanger. They are the only easily adjustable feature on a set of trucks. Tightening or loosening the kingpin nut on the bushings makes it harder or easier to turn the longboard. There are also different bushing options available that can tune the turning characteristics of the setup. Bushings For Cruising Or For Downhill? Softer bushings allow a board to turn tighter without loosening the kingpin nut as much, while harder bushings have the opposite effect. Let your discipline be your first consideration for choosing a durometer, then consider your weight. 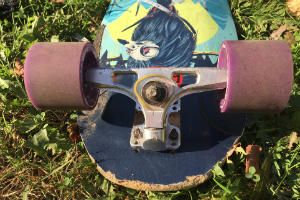 Lighter riders can use softer bushings because their weight will not force the deck to lean as much as a heavier rider’s may, but they are still adjustable by turning the kingpin nut. Downhill riders often select harder bushings (above 90A), while longboarders who like to carve normally prefer softer bushings. Typically, the bushing closest to the deck will have flat sides, and the one nearer the pavement will have tapered sides. The cone-shaped bushing allows the truck to turn a bit tighter, while the barrel-shaped bushing provides stability. Cruiser riders who carve a lot often run a double-cone setup for very tight turns in carving. For downhill, a double-barrel setup works best for stability. Barrel bushings still allow a fair amount of lean, so they also work for freeride. Stepped bushings, which provide extremely tight and stable trucks for very high speeds, are another option for downhill riders. The bits and pieces of the truck each serve their own function — nothing is extra. The cup washers on the bushings provide stability and rebound. The washers — or speed rings — on the axles keep bearings from rubbing on the hanger and axle nut. The axle nuts and kingpin nuts utilize nylon rings to keep them from backing off once tightened. The best longboarding trucks will include all these pieces, and they should always be utilized for the best possible performance. It is important to realize trucks that work for downhill do not normally work for carving because every option that stabilizes a truck at speed naturally limits its turning ability. No truck will work great for both disciplines. Generally, downhill riders should select options that stabilize their setup at speed, because oversteering and speed wobbles can and do lead to accidents. Carving and cruising riders usually select trucks that dive into turns, however. Compromises are available at every turn, but they should be made carefully. Choose a set of trucks based on riding discipline, but be certain that the trucks will work with the board you have selected. Axle width is of prime concern, especially if the longboard has no cutaways. After that, focus on pivot angle. Remember that higher angles mean tighter turns, which is great for carving but not so much for downhill. When in doubt, consider the Bear Grizzly trucks for their ability to transform into whatever they need to be at a moment’s notice.